Deep frying egg rolls gives them a crunchy golden shell. 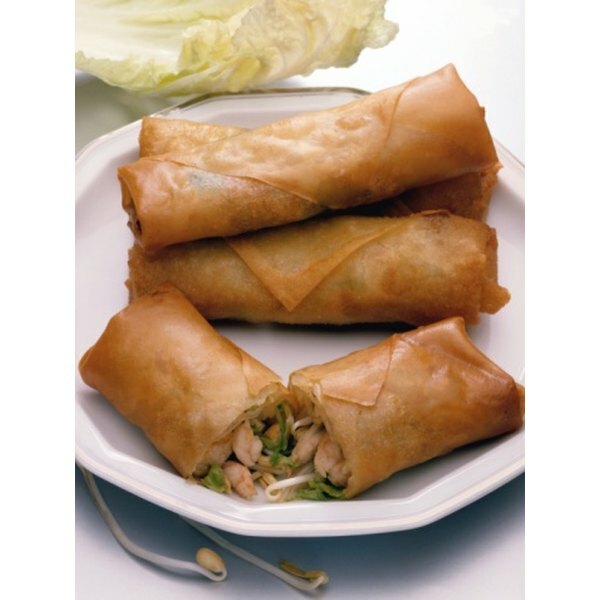 Egg roll wrappers are square dough sheets used to create a protective, crunchy shell around the filling ingredients after it is deep fried. Egg roll wrappers can be found in the ethnic foods section of most grocery stores or in Asian markets. The secret to sealing the edges of the egg roll together long enough for it to be deep fried, which completes the sealing process, is using an egg wash. Put your sealing skills to the test with this recipe. Place the chopped cabbage into a pot filled with enough water to just cover the cabbage. Bring to a boil, stirring occasionally, until the cabbage becomes tender. Drain the cabbage, return to the pan and set aside. Place the ground pork in a skillet over medium-high heat. Add the salt and soy sauce, to taste. Cook until pork is cooked through. Add the pork to the pot holding the cabbage. Stir in the cooked, chopped shrimp and half a bunch of chopped green onions. Add black pepper to taste, garlic powder, sugar and peanut butter. Whisk the egg in a small bowl. Use pastry brush dipped in the egg to moisten the edge of each egg roll wrapper before adding the filling. Place 3 tbsp. of the cabbage mixture in the center of an egg roll wrapper. Fold one corner of the wrapper across the center, just so that it covers the filling and touches the wrapper on the other side. Fold in the ends. Roll the egg roll toward the unfolded edge until it is wrapped. Press the wrapper shut, brushing it again with the egg if the wrapper did not seal well. Heat the amount of vegetable oil recommended for your deep fryer to 325 degrees. Cook each egg roll for two minutes per side, or until well browned. Drain on paper towels and serve. This recipe makes about 60 small egg rolls.